Picture the scene - strolling through the beautiful Suffolk countryside hand in hand with your loved one, you share a kiss as the sun sets and then enjoy a delicious candlelit dinner before retiring to a grand four poster bed. Sound good? 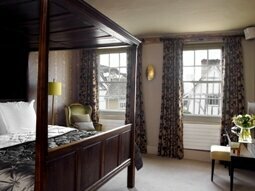 Then check out these Romantic Hotels in Suffolk & book your break now! The Westleton Crown is a romantic country hotel in an attractive village close to the Suffolk Coast, and it was the venue for Prince William and Kate's first anniversary celebration! There's a delicious AA 2 rosette menu and extensive wine list which can be enjoyed in the stylish conservatory, cosy parlour or friendly bar area with a roaring log fire in the winter. In warmer weather the charming terraced gardens are ideal for an early evening drink or alfresco dining. The rooms are modern and luxurious but retain a country style simplicity, so for a romantic escape to the country check out the Westleton Crown today! A luxury boutique hotel offering fantastic food in Suffolk is The Great House in Lavenham which is a small, award winning restaurant with rooms in the main square of the Medieval village of Lavenham. In addition to the fine French cuisine they also have a majestic king-size Jacobean four-poster bed (pictured above) dressed in fine Egyptian linen with luxurious eiderdown and continental pillows! There are plenty of little extras to make your stay even more special including a decanter of sherry and fresh fruit in your room So check them out now and book that Jacobean four-poster. 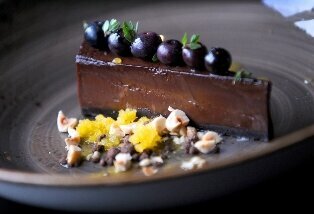 Also for foodies, The Crown & Castle in Orford is a MUST! Orford has a reputation now as a foodie town, with traditional smokeries, a fabulous bakery and several great taverns. The Crown and Castle is at the heart of the town and has views of the Norman keep which is all that remains of Orford Castle. You can indulge in an intimate candlelit dinner, including local delicacies such as Orford lobster with garlic butter, Snape asparagus with hollandaise sauce, or locally grown loganberries with Jersey cream. Owned and run by the original Hotel Inspector, Ruth Watson, this will not disappoint. Service is first class and you can see the River & Orford Keep from the Hotel so it's very atmospheric. 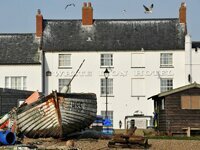 Further up the Suffolk Coast, for a walk on the wild side take a look at The Ship Inn in Dunwich. Dunwich was once a thriving medieval port but is now a quiet, idyllic village bordered by the sea on one side and nature reserves on the other, including RSPB Minsmere. The romantic ruins of Dunwich monastery remain, and you can walk along the coast up to Walberswick and Southwold in one direction, or Thorpeness and Aldeburgh in the other. The Ship offers an array of comfortable and stylish rooms with views of the sea and the marshes, and has a lovely garden that includes a 300 year-old fig tree. 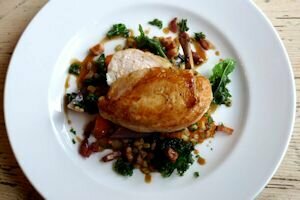 Their food is fresh and hearty and they serve many local ales in the bar so this is a great place to escape to, especially in the winter when the roaring log fire in the main bar area is a magnet. If a stay beside the sea appeals to you, then look no further than the relaxed and contemporary White Lion Hotel in Aldeburgh. With sea view rooms and a Brasserie serving the freshest fish dishes, you can enjoy the best of Suffolk. Dine on the terrace in the summer and feel the sea breeze, or snuggle up next to your loved one in front of the open fires in the winter. What could be more romantic than an evening stroll on Aldeburgh beach before settling down to a nice glass of wine at the bar. 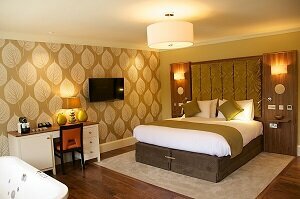 See The White Lion to book your room. For a romantic break with all the luxuries and gourmet dining, check out Tuddenham Mill near Newmarket and Bury St Edmunds. If your Romantic break goes really well then you might like to check out the Suffolk Weddings Guide for more inspiration!